First seen as a concept at the 1989 Tokyo Auto Show, the Guigiaro-penned Subaru SVX survived the transformation to production car retaining most of the show car’s traits. Notably, the concept’s slippery .29 drag coefficient and trademark split side window treatment, called an “aircraft-inspired glass-to-glass canopy”, in which only the bottom half of the window rolled down, persisted. The new four-seat sport coupe came to market in 1991 as a replacement for the XT but was more powerful, more luxurious and more expensive. As one would expect from Subaru, a horizontally opposed engine provided power. 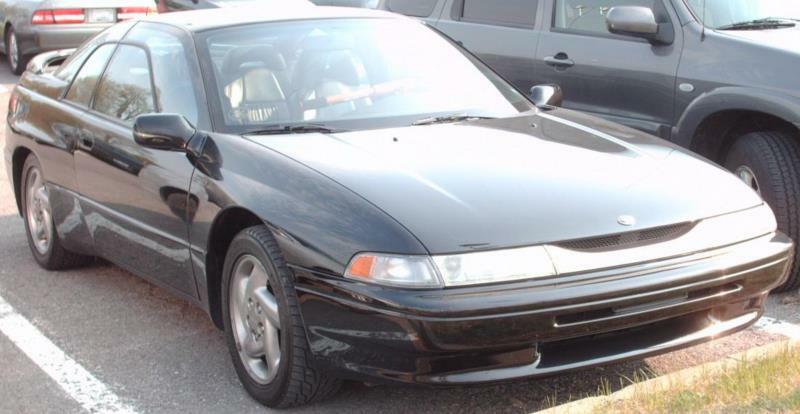 In the SVX, the unit was a 3.3-liter DOHC fuel-injected six-cylinder with 230 horsepower and 228 ft-lb of torque that sent power through a four-speed automatic transmission to a viscous AWD system that allowed variable front/rear torque split. The sprint from 0-60 took an impressive 7.3 seconds and the aerodynamic SVX had a top speed above 150 mph. Performance was further enhanced by fully independent suspension and anti-lock brakes. As proof of its prowess, a prototype SVX won the Alcan Winter Rally in 1991. As competent as the Subaru SVX was, however, it still fell short of period contemporaries such as the turbocharged versions of the Mitsubishi 3000GT and Nissan 300ZX. This, coupled with the car’s unconventional styling, high MSRP (between $24,400 and $28,000, which was much more expensive than any previous Subaru), and the availability of only one automatic transmission led to tepid sales throughout its production run. Despite these facts, in-period reviews praised the SVX for its technology—called “driver friendly high-tech” by Car and Driver—its impressive level of comfort and its effortless high-speed cruising ability. In the end, just over 24,000 SVXs were built from 1991 to 1996, with 14,257 coming to North America in two trim levels, as well as a lower cost front-wheel drive version for 1994 and 1995. Trouble areas are mostly confined to rust and automatic transmission issues, although quite a few examples have been retrofitted with later manual gearboxes that can handle the SVX’s torque. Subaru didn’t build a strong enough manual when the SVX was new, which is one reason why it was only available as an automatic. Today, this handsome coupe enjoys a healthy following with good online tech support despite its rarity. Like the XT before it, the SVX also stands out as one of the most interesting cars of its time thanks to its blend of unique styling, unconventional drivetrain and availability of all-wheel drive at a time when few other manufacturers were offering it.